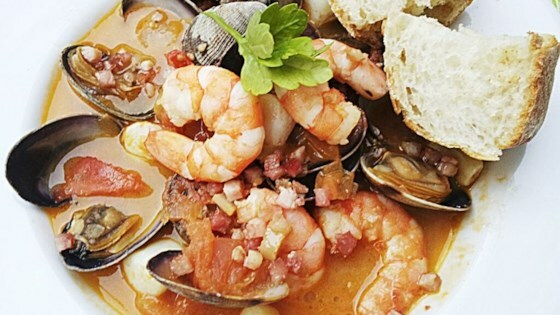 "Easy yet tasty fish soup made only with the best fresh Mediterranean fish and seafood. Use the remaining fish stock for a seafood risotto." Cut cod into pieces, reserving any scraps. Peel and devein prawns, reserving any scraps. Place cod and prawn scraps, quartered onion, carrot, celery, salt, and pepper in a large saucepan; cover with water. Bring to a boil; reduce heat and simmer until fish stock is fragrant, 15 to 20 minutes. Strain and reserve fish stock. Heat olive oil in a saucepan over medium heat; cook and stir sliced onion, red chile pepper, and minced garlic until softened, 5 to 10 minutes. Pour in wine; cook for 5 minutes. Add tomatoes; bring to a boil. Add cod, prawns, clams, and mussels; pour in 1 cup fish stock. Simmer until fish is cooked through and clams and mussels have opened, 15 to 20 minutes. Toast bread in a toaster. Rub garlic halves on to 1 side of toasted bread. Place a piece of toasted bread in the bottom of each serving bowl. Ladle soup over toasted bread and top with parsley. Your selection of fish and seafood can vary slightly, but for a traditional Mediterranean assortment choose squid, prawns, scorpion fish, anglerfish, clams, and mussels. Cognac can be used in place of the white wine, if desired.